On 17 October, 2018, I met up with the four artists who have kindly agreed to be involved in this project. 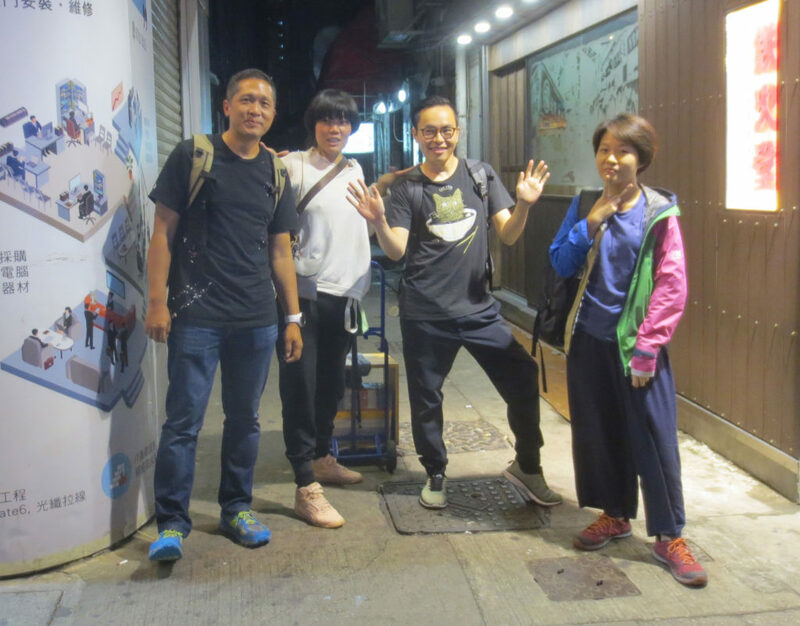 They are Dennis Wong, Elaine W. Ho, Edwin Lo, and Fiona Lee, who are all Hong Kong-based and working with sound in various ways. This was our first meeting together about this project, and after I introduced it to them, they gave me some thoughts about how sound practices might relate (or not) to social engagement. The following is an edited transcript of the conversation. Dennis Wong: Even for me, every once in a while, this question pops up: What’s the point for society of working with sound? Of course, this practice is meaningful for me personally – that’s why I do it. But in relation to my situation as a person, but also for the wider society, what is its function? It doesn’t change anything! Whatever I do, sound itself is not powerful. Sound can be very instrumental, i.e. it can serve a function: to have a conversation, to do a presentation. But that’s not actually what I’m doing with sound. Other than that kind of instrumentality, the effect of sound is very subtle. I’m not a full-time artist; I am not part of the art community. I have a full-time job, totally unrelated to sound. But because I’m working with sound, it does change how I feel – subtly, but not directly. But this is very difficult to trace. Edward: I’m very aware that in my work generally, but especially for this project, I don’t want to be too instrumental or prescriptive about what sound can or should do. In fact I find it’s actually very difficult to even ask the question about the possibilities for sound, or even propose this project, because it automatically demands some sort of evidence, some sort of visibility. So I’m trying not to do that, to try and pull back, not to make such demands. Even if this project just ends up showing a deficiency or a lack in my original idea, that’s still doing something. Last year I included Fiona’s work tide.hong kong (2017) in an exhibition I curated. 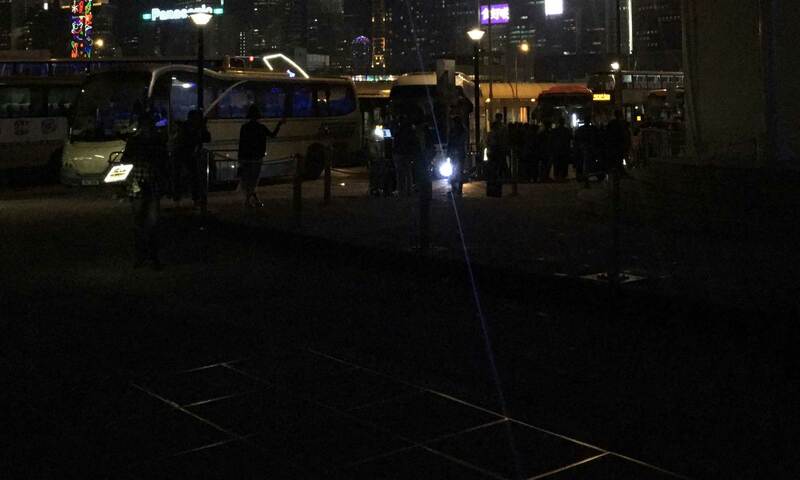 This piece combined recordings of waves from Hong Kong Harbour with sounds recorded during the Occupy protests in Hong Kong. The exhibition itself was focusing on critical art, and I felt tide.hong kong was a very appropriate work for it as I could point to it as a consideration of particular historical events, combined with a relationship to space and location, through sound. Of course, it’s a far more complex work about which I can’t simply say, “The work is about this” or “about that”. But what was clear to me was that it reflected upon people’s experiences at the time, and the social conditions in Hong Kong more generally. Edwin Lo: Sometimes I feel—not only as a sound artist but as an artist generally—this so-called “socially engaged” practice is just not for me. It is getting to be a kind of fetish. It’s becomes about how to use this as a theme to engage with institutions for more opportunities. Actually, I am not very positive about the word “social” in the context of “socially engaged art”; I think a more proper way to think of it is as the environment – this is a more neutral term. Elaine W. Ho: I completely agree with what Edwin said, about how “socially engaged” is being overused – it’s become a strategy. The idea that you are going to make society better or improve some part of a situation is very problematic as well. But I think what Edward was talking about is not that approach, but a work is socially engaged in the sense that the participant is reacting and attentive to things that are happening in the conditions, in the context, and the socio-political environment that they are in. I think that’s very relevant for a lot of the sound practices that I see happening in Hong Kong. Edwin: I taught a workshop for some students recently, and that gave me a very deep feeling of how technological acceleration (via social media, etc.) is frying our senses. It’s not only about hearing, but also about the overall perception of the artist and of society. I started to question why these students don’t try to escape this technological acceleration, why they don’t liberate their senses? This is not only ontologically, but also listening to society, listening to the artist, person-to-person. Edward: Are you trying to do that with your work, do you think? Edwin: I don’t think I’m doing that. As I said I’m not good at dealing with social issues. I’m concerned about them, of course, but in my work I want to use those issues as a way to reflective thinking, instead of showing things to people directly. I feel that as artists we can’t do much. At the same time, we are not obligated to have this kind of consciousness towards society. But that certainly doesn’t mean that we are totally detached from society. Elaine: Do you think people are actually listening to stuff more now? Because everyone’s wearing their headphones. What are people listening to? Actually, people read more now on their phones. Edwin: Yes. But it doesn’t mean they know more, or they understand more. Those are two different things. They listen to more music, but it doesn’t mean they are totally engaged with it. Fiona Lee: Maybe because the information is quite overwhelming? They don’t want to spend time studying it. Every day they are just passing by everything, not engaging. It’s like they don’t have much curiosity. Edwin: When I talked to Ip Yuk Yiu—Fiona and my common teacher—he’s very critical about students. He said right now students are not interested in anything. They are disinterested. Dennis: In other words, they are less engaged! Edwin: Yes, they don’t even want to engage! They want something fast. This hasn’t only just happened; it also happened in the past, in the musical tradition and with sound art. It is about how we perceive sound, how we have a deeper and more coherent experience, often with longer durational compositions and performances. But we still have the same lack of attention span for such things. This is a very interesting situation, because it means maybe we didn’t change anything, we still have the same kind of mentality as in the past. Fiona: Edward, you should talk with soundpocket about your project. They organise a lot of soundwalks with other organisations. Like with the Birdwatching Association, for example, that experience was quite interesting. The birdwatchers were too obsessed with the birds and were always looking for them rather than listening. So the walk was not that functional as a soundwalk! Elaine: You know there was a Hong Kong artist, Yim Sui Fong, who made a series of works involving pigeons with whistles attached to their feathers? She lived in Beijing before and that’s where she learned about them. The works were related to the Hong Kong handover in 1997. During the handover, China organised this huge pigeon release ceremony, to have all these pigeons migrate back to China, symbolic of the return of Hong Kong to the Mainland. But because it was raining that day, some of the pigeons never left, they stayed on the Hong Kong side. So Yim Sui Fong invited a pigeon-keeper from Beijing to come to Hong Kong to catch these pigeons and put whistles on them. She took the traditional whistles and modified them to make two specific notes, which when played in a particular sequence are the last few notes of the Chinese National Anthem. But because you can’t control the pigeons, it becomes a chaotic sound. Edward: That was actually a popular subject for sound artists who came to Beijing. The British Council had a project “Sound and the City” in 2005–6, organised by Colin Chinnery and Yan Jun. John Cusack recorded the whistles for that project. It used to be a very distinctive “Beijing” sound, which people latch onto quite easily. Such a distinctive sound is an interesting way of focusing on something that is happening in your area of society, which in this case also reflects a historical tradition. Edwin: But for this project I don’t think we should try to fit everyone’s practice into the territory of socially engaged art. We should try to make it problematic. “Problematic” is not a negative term for me; it’s a way of reinvention, how we can imagine this so-called society – this environment. We should make more and more tensions between the kinds of things that we are interested in, rather than a sticking to a coherent narrative, a grand narrative of “social engagement”. Dennis: I think it is possible for this project to have many different layers of meaning or dimensions at the same time. That would be more interesting, and make it more problematic, because once you have more layers, and more dimensions, it becomes confusing. The engagement comes when the audience have to start to think about the material and think about themselves. They are not just accepting what other people tell them about the sounds. Fiona: Also, Michael Leung’s [lecturer at Hong Kong Baptist University and organiser of the course this project is a part of] and my practices are quite different; it’s certainly true that he tends to have social engagement with people, with societies. One time I went on a camp with Michael and another artist (we were invited by AAA Asia Art Association). Michael found a location in Sai Kong, a distant area that you had to walk maybe one and a half hours to get to. Michael had a good connection with the people there, so he was the initiator and the connection with the place, and through his network he found a vacant house we were able to stay in and do some performances and pieces in. It’s always a cooperation when I work with him, so I like his practice as it is a practice that I personally cannot do. At the same time, I know my abilities and how to involve people to experience something in my way. That is another engagement with participants, I think. Edwin: I also have a memory of another soundpocket event, the “Around sound art festival” in 2009, on Lamma Island in Hong Kong. I think this is also the same kind of thing, but then the artists lived there for a longer time, doing performances at specific times, at different places on the Island. Dennis: That is also quite remote. It’s not very easy to get to. Edwin: Yes, you have to take a ferry, and then you walk 20 minutes to get there, because it is in another bay. I really like this kind of experience. That event was probably the first time Akio Suzuki and Mike Cooper were in Hong Kong, and Yan Jun was there too. This is the first generation of the Around sound festival. Edward: I think Yan Jun released his recordings from this as “Lamma Island Diary” on Dennis’s label Re:Records. Edwin: That kind of experience is not directly engaged with society, but it has a certain dimension to situate the events in a certain context, more closely, and away from white wall spaces. I also recently discovered an abandoned village, where they were going to develop some luxury housing, but in the end, they didn’t build them. There are now a lot of empty houses there. So maybe we can try to engage with this kind of abandoned space. That is another dimension. Dennis: I think one dimension you can try to look into for this project, is to move away from the standard way of doing a sound artwork, like site specificity, activation, or going to these abandoned villages. I would like to know about how all these people who work with sound operate as people? I say that because I would say I am more socially engaged as a sound practitioner when I’m not making art. For example, I always want to keep my sound work separate from my everyday life. I don’t want anyone from my work to know that I’m doing something so strange! But sometimes they find out, and their response is very interesting! One time, a colleague saw my video on YouTube. He told me, “Oh you’re making strange things, but I thought for the whole video you were just setting up!”. I told him, “Well, that is the performance!” For him, it is unbelievable! Another example is how what I’m doing influences how I am as a father. Some people, if they really like music, they will force their child to listen to it, so when they grow up the child is conditioned to like, say, The Beatles. But I never played my son anything. I let him discover for himself. So now, he is still “normal”, I think. I want him to have his freedom; even though I like this or that music, I don’t want to condition him to like it. These are the kinds of every-day interactions I am talking about. They are based on what I’m doing in my life. They are not directly related to the art-making process, but they get in the way of everyday life. There was one time I went to Beijing for a gig with an instrument, and at the same time my company wanted me to go to Tokyo to do something. Because time was tight, they wanted me to go directly from Beijing, but I refused because I had my instrument with me. In the end I didn’t go, and they felt very unhappy and confused: “How come you are so stubborn?” These kinds of things are social on a personal level. Of course, they don’t really change anything, but somehow they can trigger a lot of passion, or frustration from the people around me.